After 44 years of service in the Catering Department at Roscommon University Hospital, Helen Hunt has finally hung up her apron. Helen Hunt from Four Mile House, County Roscommon joined the Catering Department back in 1974 as a catering assistant, and it wasn’t before long she took up the position of chef where she demonstrated her excellent cookery skills, triumph in her dedication and commitment to her new role. 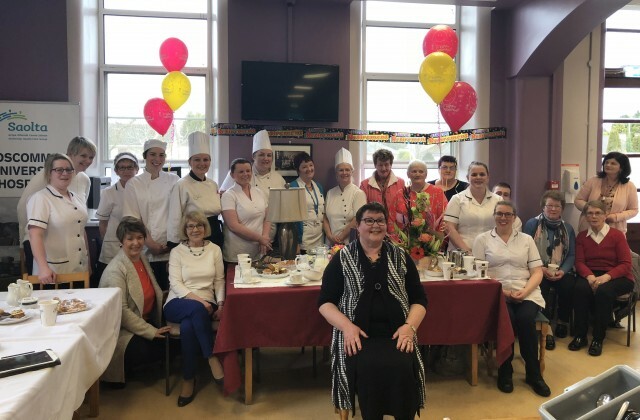 At a recent retirement party organised by her colleagues from the Catering Department, Helen expressed her gratitude to all her colleagues past and present, management and staff for the wonderful 44 years she had working in Roscommon University Hospital. She recounted her early days as a catering assistant when staff lived on campus and all the good times she shared with her colleagues and acknowledged the friendship and support she got from her colleagues which sustained her. Staff from various departments paid warm tributes to Helen and thanked her for her work, dedication and loyalty over the years and the generous helpings which she served. They recounted all her pastimes and interests, particularly country music, fashion, accessories and travelling. Current and former members of staff from the Catering Department at Roscommon University Hospital for the retirement of Helen Hunt.